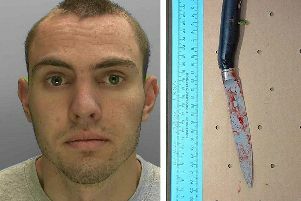 A man has been jailed for 14 years after stabbing a man repeatedly in the thigh in Haywards Heath, said police. Ricky Minott, 26, appeared at Brighton Crown Court on February 5, after being charged with GBH with intent for stabbing. Officers were called to a report of a 36-year-old man who had been stabbed and was bleeding heavily at a flat in Burchetts Close, Haywards Heath, on January 20, last year. A Sussex Police spokesman said: “Minott had attended the flat to collect a debt from the victim and when he was told the debt would be paid the next day. “Minott reacted with rage punching the victim before carrying out a frenzied attack stabbing him several times in the leg with a lock knife. “The victim was in hospital receiving treatment for several weeks and has life-changing injuries from the wound to his leg. “Minott was believed to be involved but went to ground and was arrested in August last year in Kent. Minott stood trial at Lewes Crown Court between December 18 and 22, and was found guilty of the GBH but not guilty for the witness intimidation, said police. Detective Constable Adam Tidy said: “The victim has been hugely affected by this attack and now has to use a stick to walk. “His sciatic nerve was completely severed and he has very little feeling in one of his legs. “He has to take several different prescribed medicines to combat the continuous pain suffered from the nerve damage caused, as well as medication to help him sleep. “He was pleased that the offender was brought to justice. “The fast response of the initial paramedics and police officers on scene probably saved the victim’s life as he was losing so much blood his injuries were believed to be life-threatening. Minott must serve a minimum of nine and a half years and a further four on licence when he is released, said police.